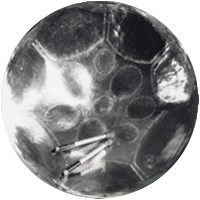 Stunt Records, 2017 "Rudy Smith and his instrument, the steel pan, were born at the same place and time, Trinidad in the 1940s, and if there are any other jazz virtuosi of the instrument, I have yet to encounter them." "Instrumentets spröda korta ton får i Rudy Smith´s hantering en distinkthet i sin egenart som bryts loss från övriga instrument på ett förunderligt sätt. Närmast likartat som en xylofon. Melodiöst och vackert tilltalande musik i den swingfyllda andan uppblandad med sirligt vackert balladspel cd:n genom." 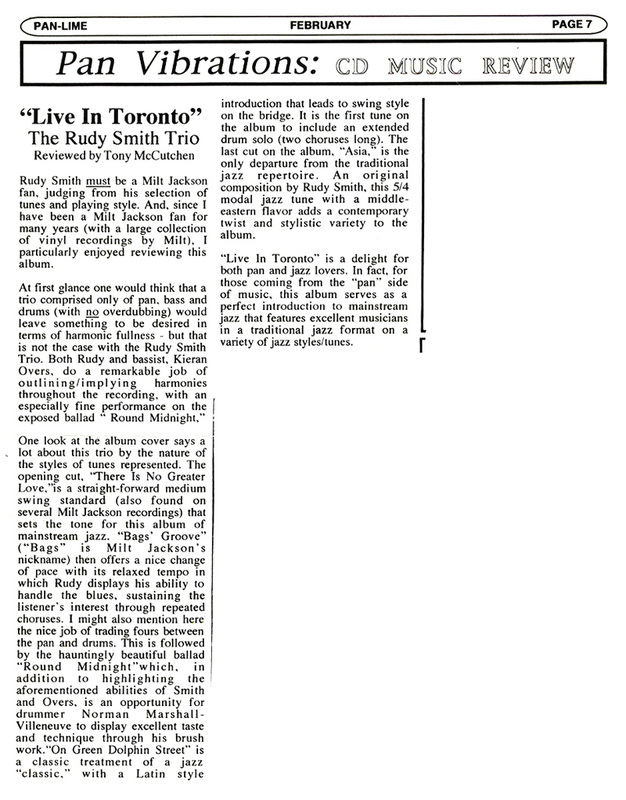 "Pannist Rudy Smith, a Trinidadian resident in Denmark, drawing on a long and distinguished career in which he has collaborated with the great and the good of the jazz world, makes a strong case for what was once regarded as a novelty instrument as a legitimate vehicle for jazz expression in the same way that Toots Thielemans elevated the chromatic harmonica." "Glass World finds Smith back fronting his Danish jazz band, re-inventing the idea of the steelpan as a solo instrument for jazz without the feeling of it being too avant garde. " "Die Gelöstheit, die er dabei an den Tag legt, erinnert zuweilen sogar an Toots Thielmans - so entspannt, so relazt geht es auf"
"Gruppens udgave af Old Lady Walk a Mile and a Half" er et fint eksempel på den tæthed, der er resultatet af mange års samspil"
"Når man lægger ører til hans nye album på danske Stunt Records hører man straks virtuositeten, men også inspirationskilderne: Milt Jackson, Bobby Hutcherson, Oscar Peterson og John Coltrane"
"Meist sind die Stücke im Jazzgewand mit viel Swing und Spielfreude, mit hervorragenden Solisten und ihren spannenden Improvisationen." "So there’s much experience here individually, but collectively, there’s palpable chemistry and the record just oozes spirit and feeling. You can hear the mutual respect seeping into these performances too, between the four musicians." "This is one of the jazz year’s most marvellous records: certainly one to buy and savour with a bottle of Trinidad rum and a roti." 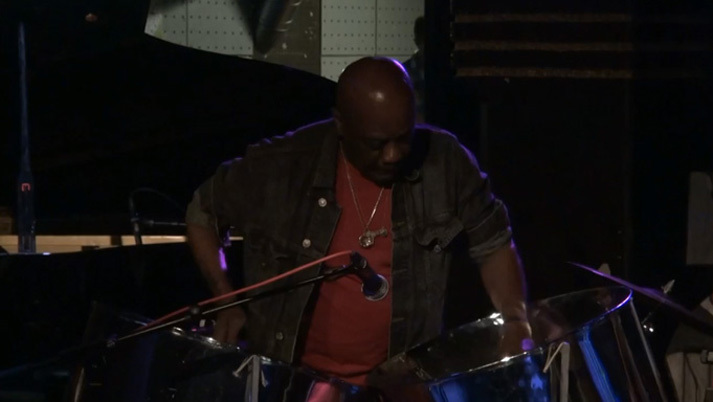 "Born in 1943, in Trinidad, Rudy Smith is known as the musician who turned the steel-drum into a jazz instrument, thus creating his unique sound palette with this kind of percussive instrument and developing an incredible technique. It’s not surprising that his phrasing is sometimes reminiscent of the vibraphonists’, for he’s mainly influenced by Milt Jackson and Bobby Hutcherson. Accompanied by great scandinavian musicians, he develops a repertoire close to the music of Coltrane, thus taking away his instrument from the etiquette World Music ". Caprice Records, 2015 "Perhaps the most jaw-dropping aspect of this compilation album is how complete it is. For some artists, their compilation is merely a musical summation of their life’s work, which needs no explanation, depending on the artist’s popularity. But since steelpan artists aren’t as well known in the world as they deserve to be, having the narration booklet with historical photos as a guide to both Smith’s life and musical journey, supports the album perfectly for the listener"
"How many notes is it I wonder? Rudy Smith - steeldrums virtuoso came and performed at our jazzclub here in Christinia, Copenhagen and Charles that was first time in a while that I acually experienced a true genius!! Bebop/classical/improvised/steeldrums on the level of Bird and Monk!! He played the history of a deprived people Um um um! "'There is a depth in them there drums' sagde Cecil Taylor-janitsharen Andrew Cyrille engang, da han optrådte med Rudy. Han kunne have sagt det samme om Rudy selv." "Meines Wissens ist er der einzige Steeldrummer in der internationale Jazzszene, und was er aus seinem Instrument herausholt, lässt sich verstandesmässig kaum nachvollziehen." "Live in Toronto is a delight for both pan and jazz lovers. In fact, for those coming from the pan side of music, this album serves as a perfect introduction to mainstream jazz." "Smith lärde sig tidigt behärska dessa och får betraktas som en viktig kugge i musikens utveckling på Trinidad. Numera bor han i Danmark men återvänder ofta till Trinidad där han agerat huvudarrangör för den årliga stålbandstävlingen Panorama. Mycket jazz har det blivit genom åren, med alla från Bernt Rosengren och Ulf Adåker till Horace Parlan och Bebo Valdés. Smith har även medverkat på inspelningar med till exempel Bob Marley, Ahmadu Jarr och Eric Bibb." "Smith gives his twins drums fierce echoes of vibraphone and marimba, the ringing tones surprisingly effective"
"Smith is a talented writer and novel arranger of jazz standards. He flits like a hummingbird from style to style, with clear references to Trinidad’s neighbours, in hints of Venezuelan tonada and one Afro-Cuban piece. There’s even flamenco-jazz, jazz samba and JS Bach plus R&B." 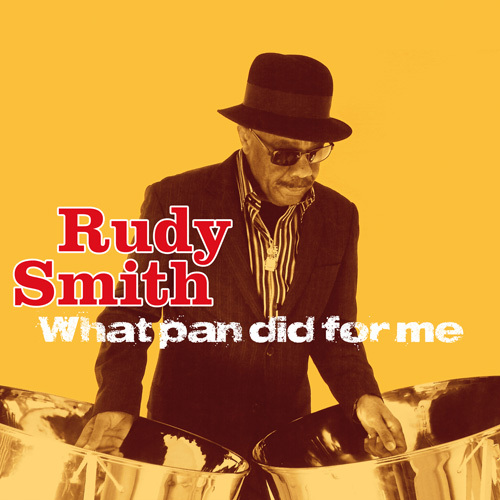 "What Pan Did for Me leaves behind the steel pan stereotypical and steeps the pan in versatility and durability and proves the sheer mastery and musical vision of Rudy Smith." "Steelpan Jazz at Lincoln Center (New York) a Success. This night belonged to the Rudy Smith Quartet and the Caribbean All Stars, who captured the fancy of the audience. 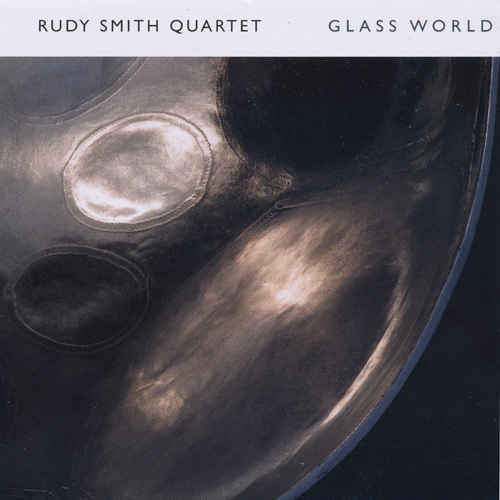 Rudy Smith gave each musician ample space and time to define and establish their own personal relationship with the audience within the confines of the quartet." "With another breathtaking performance in Toronto, Rudy continues to make his mark [...] As the quartet wrapped up their second and final set for the night, the audience responded with a standing ovation and got the encore they craved." 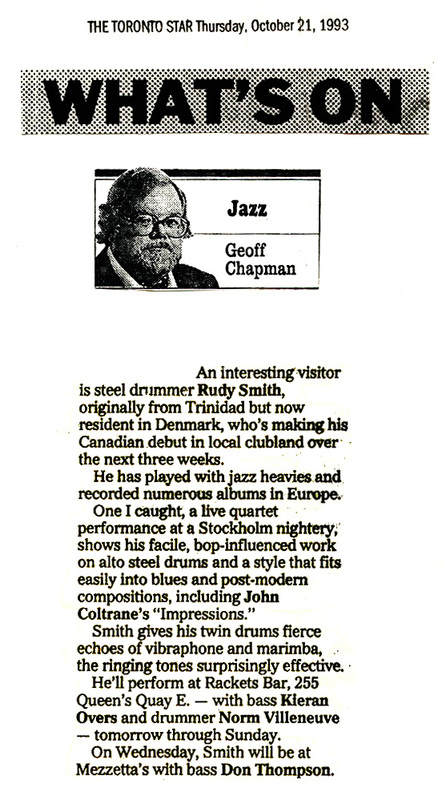 "The hollow tones of a Steelpan might seem a major disadvantage for the warm note-bending playing required in jazz soloing, but with a delicate style of improvisation and careful attention to each song's structure, Smith has defied convention and emerged as a sought-after player." "I have been a secret fan of Rudy's for many years - from the moment i first heard him, I've been raving about his incredible musicianship, his impeccacble taste and soulful phrasing. He and Toots Thielemans, who both make you forget the unsurmountable technical defficulties of their respective instruments, belong in my personal gallery of heroes with Louis, Duke, Bird, Stuff, Stan, Dizzy and a few that you probably never heard of." "I just think it's marvelous album and Rudy is one of a kind. I have never heard a steel-drum player like him before in my life! I am very impressed with his compositions." "It would be all too easy to make a fuss about the apparent novelty of the steel drum as a jazz instrument. The sound of the pan, after all, is the sound of calypso, not of bebop- or blues-note, at least, until Rudy Smith, a trinidadian musician traveling out of Copenhagen, strikes the first notes of a hip tune like John Coltrane's "Some Other Blues". Damned if it isn't perfectly natural." "Double alto pan player Rudy Smith has started a new phase in the story of pan. And not only in the story of the pan but in the story of Afro-American music. 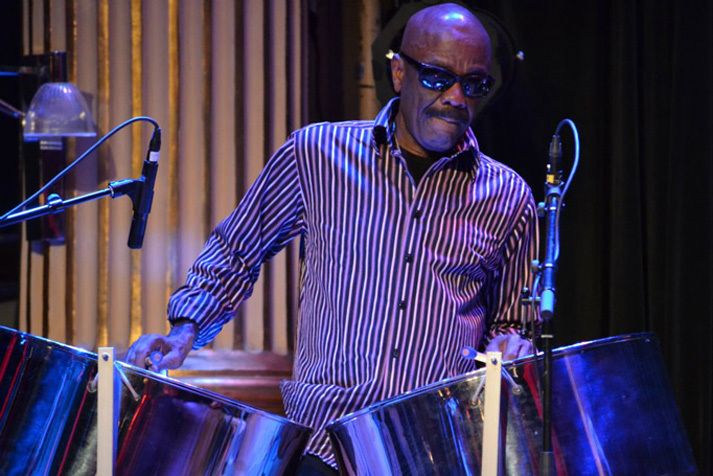 Rudy Smith has married the most important Afro-Carribian invention in the field of musical instruments, the steelpan, to the most important Afro-American musical tradition, the jazz. And more than that. He has developed a solo style of the steelpan which has not been heard before. His technique is dazzling. But it is not a question of empty virtuosity. 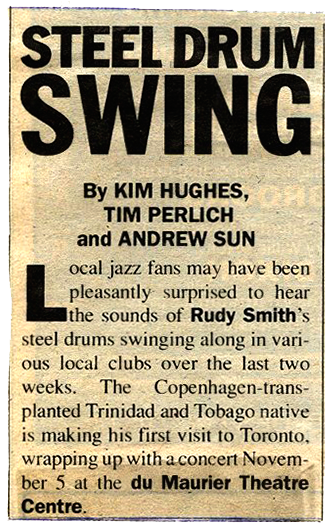 Rudy Smith's playing is marked by the same astonishing inventiveness that has created the steelpan." 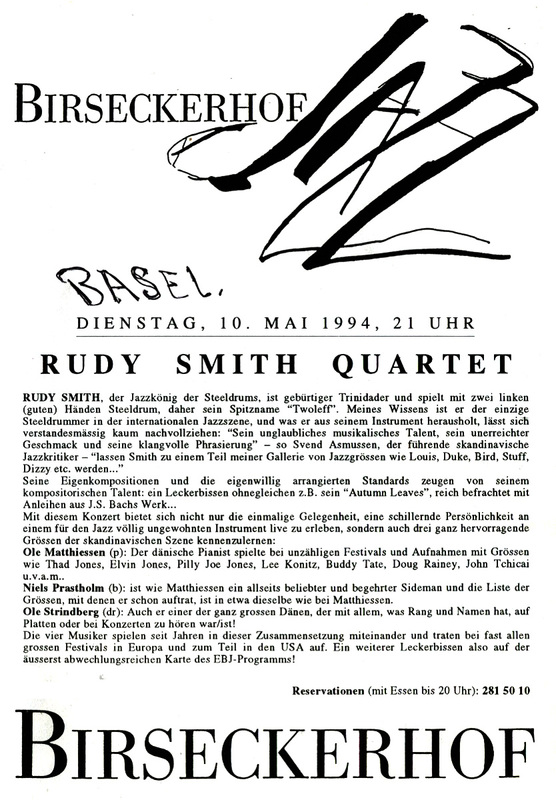 "It may perhaps be rather natural (and easy) to consider the use of steel-drums in jazz as something of curiosity, but the way in which Rudy Smith handles his two 50 cm-wide metal things it is not difficult for him to convince us of thier legitimate use in jazz."